Honeywell evohome Radiator Multi Zone Kit (HR924UK) - The Honeywell evohome Radiator Multi Zone Kit (HR924UK) consists of 4x Honeywell evohome HR92UK Radiator Controllers and allows multizone control of a radiator system when used with a Honeywell evohome Connected Thermostat Pack (ATP921R3100). Honeywell R8810A1018 Wireless OpenTherm Bridge - Honeywell R8810A1018 Wireless OpenTherm Bridge (R8810) allows compatible Honeywell thermostats and controllers to wirelessly communicate with OpenTherm enabled boilers. The R8810A1018 is compatible with evohome (all versions), CMS927, DTS92E, T87RF and RF2 Pack 3 and it replaces the BDR91 Wireless Relay Box. Honeywell Single Zone Thermostat Y87RF2024 - The Honeywell Single Zone Thermostat Y87RF2024 consists of a T87RF Single Zone Wireless Thermostat and a BDR91 Wireless Relay Box. The Honeywell Single Zone Thermostat is simple, affordable and everything you need to upgrade your existing room thermostat to ensure accurate control of your heating system. Honeywell HCS80 Extension Module - The Honeywell HCS80 Extension Module upgrades the HCC80R Underfloor Heating Controller from 5 zones to 8 zones. The HCS80 extends the maximum amount of thermal actuators that can used with the HCC80R from 15 to 24. Honeywell BDR91 Wireless Relay Box - The Honeywell BDR91 Wireless Relay Box is suitable for use with the Honeywell range of wireless controls. The BDR91 transmits on 868MHz and is able to switch on and off central heating components with 230v or volt free switching (max current 5A). Honeywell evohome HR92UK Radiator Controller (HR92) - Honeywell's evohome HR92UK Radiator Controller can give you individual wireless control of a single radiator when part of a smart zoned heating system using Honeywell evohome. 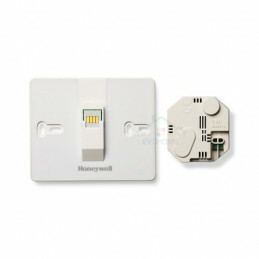 Honeywell evohome Wall Mounting Pack ATF600 - Honeywell evohome Wall Mounting Pack ATF600 consists of a Wall Mounting Plate and AC-DC Power Supply specifically designed for the new Honeywell evohome Wi-Fi Connected Thermostat. The Honeywell ATF600 Wall Mounting Kit provides the facility to secure the evohome controller to a wall surface.